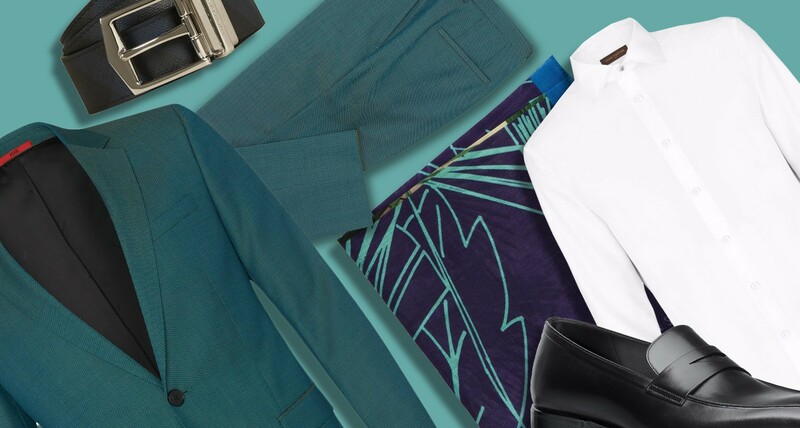 Show the world you aren’t afraid of colour by wearing a suit in an unexpected shade. Green may seem daunting at first, but it’s a versatile colour that most men can pull off — pick accessories in navies, blacks, and whites to help ground the ensemble and keep you looking stylish. This is the suit for the man who isn’t looking to play it safe. The rich green colour pops against the patterned fabric — vibrant without being overwhelming. The slim fit and flat-front trousers are modern and versatile enough to dress up or down. Let the green suit shine by pairing it with an understated crisp white dress shirt. Skip the tie and simply button it up to show off the polished accent studs in the spread collar and cuffs. Add a painterly accent with this pocket square by Paul Smith, which mixes a photorealistic palm print with an abstract version of the same image. This reversible belt from Burberry gives you the option of picking basic black or accessorizing with a subtle navy and black version of the brand’s classic check. The hand-painted edges are a refined finishing touch. 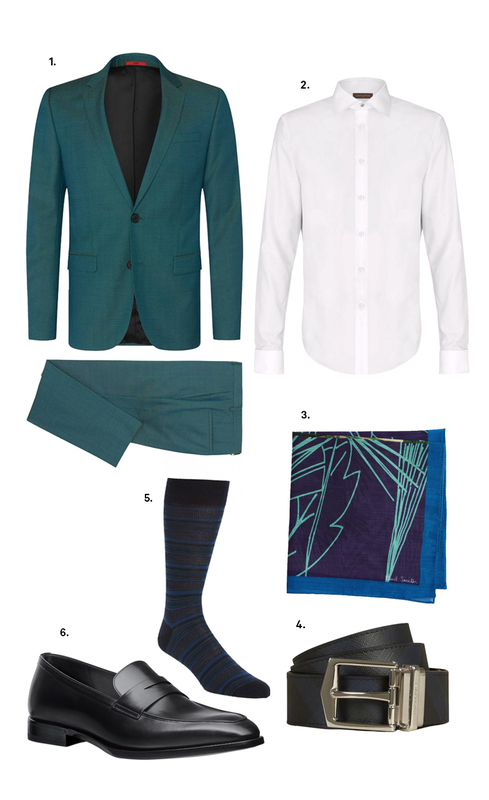 Tie the colours of the outfit together with a smart sock. These are handcrafted from breathable merino wool in a textured bird’s eye stripe pattern. Finish off your look by slipping on a pair of loafers. Dressier than a penny loafer, they still bring a more laidback vibe to an outfit than a traditional dress shoe.